There were nineteen Missions established on or near the coast of California from San Diego to San Francisco between 1769 and 1804 by the Franciscan Padres. Two additional Missions were established much later north of San Francisco. The twenty-one Missions were planned so that you could get from one to the next in one day and were run by missionaries as a way of bringing Christianity to the local people. 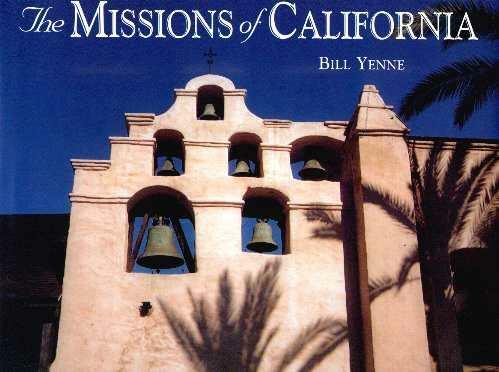 Author Bill Yenne has chronicled the settlement and development of California which makes for an interesting read. Initially thatched roofs, in 1790 they introduced clay tiles which became the standard at all the Missions. Most of the Missions had a quadrangle around which were homes for the "residents" as well as workshops where many items were made. Supported by the Spanish government and by grants from wealthy donors, the Missions were busy and productive places. Most of the Missions have been restored and attract thousands of visitors. I went to the Carmel Mission just a couple of weeks ago but wasn't able to go in as they had closed the doors early (3:45 pm) because of a function they were hosting a little later in the gardens. There are 21 chapters on these 21 Missions and beautiful illustrative photographs by the author. The inside covers show a map of all the Missions and how they are linked, which is a way of planing your own Missions Tour. These places of refuge and peace must have been a very welcome sight to those on the road. The full Mission names, addresses, telephone/fax numbers, e-mail and web addresses (where applicable) have been supplied. THE MISSIONS OF CALIFORNIA may be purchased and/or ordered through your local bookstore. Conclusion - Extremely interesting and informative. Great to read before you head out Mission visiting.